Flora’s “Soluble Fibre” provides an excellent source of soluble fibre, which contributes to regular laxation/bowel movements. The ONLY product approved by Health Canada for IBS Relief! It is an all-natural, vegetal, water-soluble, non-gelling, dietary fibre that is derived from guar gum. It is treated with a natural enzyme that allows it to completely dissolve in water. Unlike other fibre supplements, it is tasteless, colourless, odourless and non-gritty or goopy. It is a true regulating fibre that helps relieve both constipation and diarrhoea without the gas, bloating, and cramping often associated with other types of fibre. 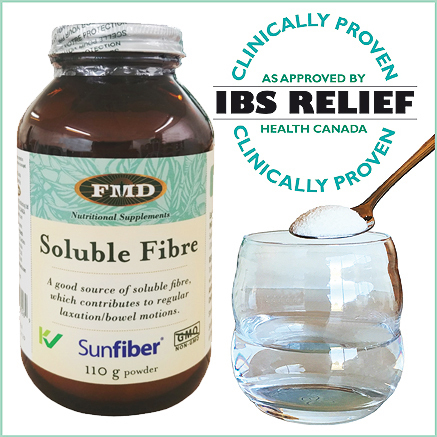 If you suffer from IBS, Flora’s Soluble Fibre can help! juice, or other beverages. Take 2 hours before or after taking other medications. Adults: Take one serving, 1-2 times daily. Children age 9 years +: Take one serving once daily. Japanese supplier Taiyo has bolstered the already impressive scientific and regulatory backing for its Sunfiber gut health ingredient with new approved health claims in Canada and others in Japan. Soluble Fibre DISSOLVES COMPLETELY CLEAR, is ODOURLESS and TASTELESS! You won’t even know you’re having it! It has also been clinically proven and approved by Health Canada for providing relief from Irritable Bowel Syndrome.